Finally, the time has come for the winner. 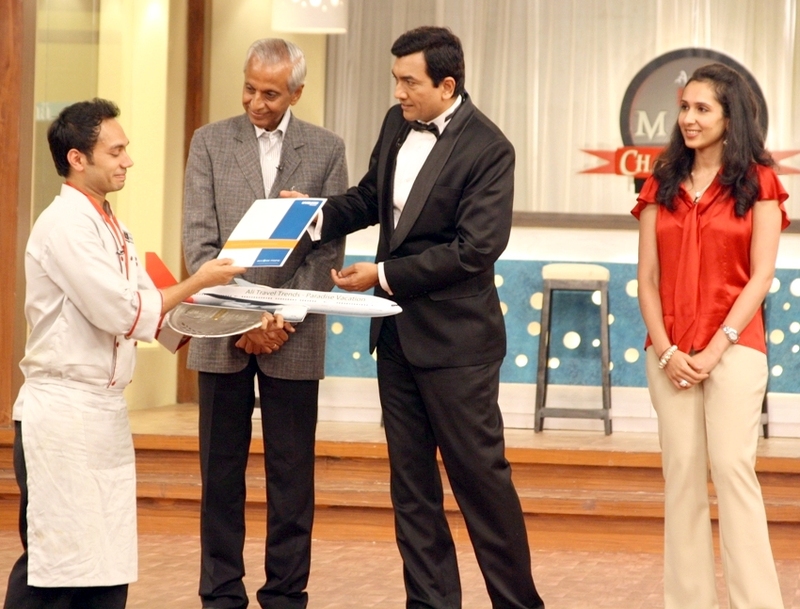 Chef Sanjeev Kapoor announced the winner of AMUL FOODFOOD MahaChallenge. The winner is Saransh Goila from New Delhi. The winner received gift of Rs 10+ Lacs including his own show on FOODFOOD, gold coin from Amul, a Kitchen makeover from Sleek and an all expenses paid trip for 2 to gourmet mecca, Italy. “Winning a show like FOODFOOD Mahachallenge is not just a prestigious moment but also an association with Sanjeev Kapoor Sir who has been a pioneer and trendsetter of sorts. He has created historic milestones in the field of Indian cooking and has given Chefs a new identity as hosts. I look forward to hosting a new cookery show with FOODFOOD channel and of course ensuring our Indian chefs and our cuisine gets a bigger slot on the world map” said Saransh Goila. Saransh was born and brought up in Delhi. He holds a degree in food photography. He wanted to be an actor and has done an acting course from Barry John’s institute. He is well versed with various international cuisines, but has limited knowledge on Indian cooking. Thomas Keller has been his role model & inspiration. He loves to bake and make desserts and believes that challenge and innovation are the 2 pillars of his kitchen. The Grand Finale started with three finalists from Delhi – Housewife Sangeeta Anand, food enthusiast Saransh Goila and talented Sanjay Singh Yadav. The final task given to the contestants was to prepare a seven course meal using seven implements in two hours. Started in early September, AMUL FOODFOOD MahaChallenge is a show that presented a kitchen as the battleground for the sexes to compete against each other based on their culinary skills. Bollywood Diva Mrs. Dixit Nene was encouraging the girls team along with a professional mentor Chef Harpal Singh Sokhi. The mentor to the boys team was Chef Vandana Castellino. The judging panel was led by Chief Judge Chef Sanjeev Kapoor.